DECIDING FACTORS MMS DECEMBER 2018 28 mmsonline.com Data-Driven Manufacturing manufacturing. This roadmap shows where a manufacturing company is starting out, and then defines how to proceed along a continuous series of implementations. 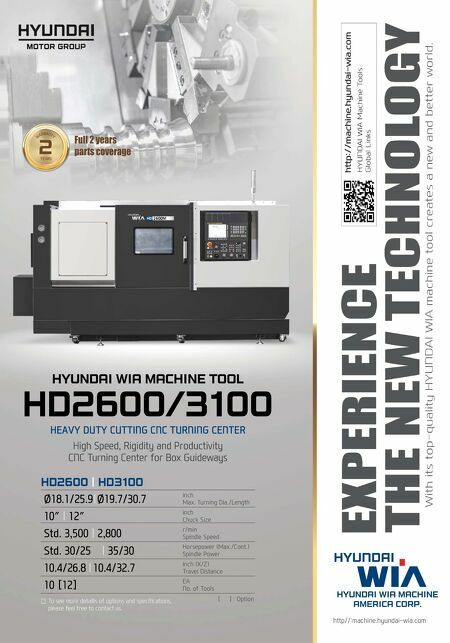 For example, a shop may start by installing a machine data-collection system to monitor machine and operator performance and relate them to productivity. "The roadmap, however, shows that this is just the first leg of the journey. Having and following a roadmap keeps a company from turning down a dead-end street or having to backtrack to reach a connection that leads to the next level of improved decision- making," he said. He emphasized that the road- map gives the shop direction as well as forward motion, adding that the roadmap should clearly state the business case for the transition to data- driven manufacturing. "If you talk IIoT, you must also talk ROI (return on investment)," he said. Mr. C.S. went on to explain that MaxByte offers an array of products and services designed to assist manufacturing companies on their journey to IIoT. The company has a growing customer base in India and other global markets but is now work- ing with GBI Cincinnati ( info@gbicincinnati.com ) to reach potential customers in North America. "What we think makes us different from other IIoT technology providers is our focus on working with customers to develop and implement a customized digital transformation roadmap," he said. "We want manufacturing companies to see us as travel agents and consultants, although we have an IIoT platform and the essential software applications, as well as hardware such as sensors to capture and transmit digital data, to pave the path set out in the roadmap." He added that one of the challenges he encoun- ters is the tendency for many manufacturing com- panies to want a quick fix or a shortcut to IIoT. "It's fine for a shop to want to know what machines are running or not running, but knowing why the ones not running aren't running and what is needed to get them running again will be greatly more valu- able. However, a shop can't stop there," he said. Likewise, he said, a company may be intrigued by augmented reality or machine learning, but if these technologies don't fit into an overarching plan to reach specific objectives, they won't result in real, measurable progress." An IIoT roadmap encourages companies to establish long-term goals, see the value of a long-term solutions partner and make the ongoing commitment to reaching these goals. It also helps them understand that the IIoT transformation requires a substantial and sustained investment, but one that provides a stream of div- idends, not just a one-time payoff that a quick fix might offer. Another challenge he encounters is that man- ufacturing companies easily can become over- whelmed when they see all the different options and elements IIoT may involve. "Sometimes IIoT solution companies are too quick to present an overview of everything they can do or have to offer," he says. "These presentations can be espe- cially off-putting if the array of products or services does not cover connections to the equipment on the shop floor." This missing link is critical because most shops see their CNC machines and legacy equipment as the starting point or the logical entry into the world of IIoT, he pointed out. Here again, he said, thinking in terms of a road- map is the way to counter this negative tendency. 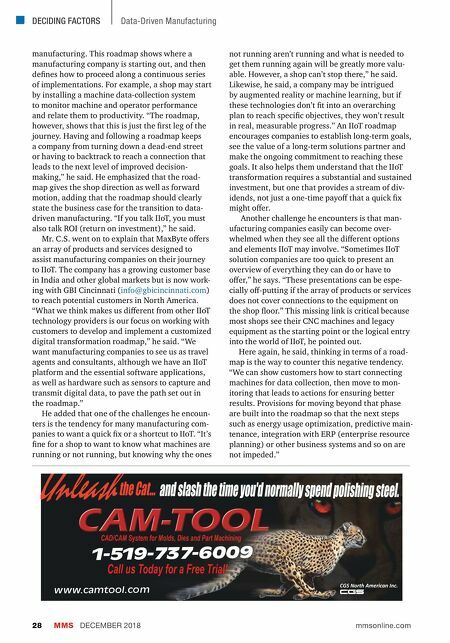 "We can show customers how to start connecting machines for data collection, then move to mon- itoring that leads to actions for ensuring better results. Provisions for moving beyond that phase are built into the roadmap so that the next steps such as energy usage optimization, predictive main- tenance, integration with ERP (enterprise resource planning) or other business systems and so on are not impeded."